​Since the early 1980’s the congregations of Paisley High, St. John’s and Orr Square Churches of Scotland along with the Paisley Congregational Church had worked together in the Wynd Centre – an ecumenical Church Outreach Centre. In 1987 Congregations, Kirk Sessions and Deacons Court of these Churches decided to bring together representatives in a Joint Strategy Committee to consider the ways in which the Churches might be better co-ordinated and be more effective, and the Congregations better able to serve the community in which they were placed.It was not long into that process when the various benefits of coming together were recognised and the Joint Strategy Committee began its work of investigating, discussing and planning the strategy and structure for an ecumenical Church in the centre of Paisley. In February 1990 the proposed Basis and Plan of Union was published, copies being distributed to every household within each Congregation and Congregational meetings organised so that everyone could be fully informed before a decision was taken. 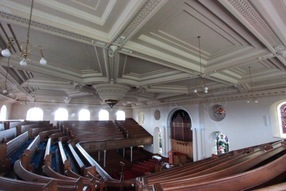 When that decision was taken later in the year, the Basis and Plan of Union was overwhelmingly accepted in the congregations of Paisley High and St. John’s Churches of Scotland and Paisley Congregational Church, but was rejected by Orr Square Church of Scotland. The three remaining Churches continued in the Joint Strategy Committee and at the General Assembly of the Church of Scotland in May 1991, the Assembly gave its unanimous blessing to the Basis and Plan of Union. In September 1991 Oakshaw Trinity Church – an amalgamation of Paisley High Kirk, St. John’s Church of Scotland and Paisley Congregational Church – was born and the Congregations began the process of coming together as one and helping to mould together three different traditions. One of the major questions in the creation of Oakshaw Trinity Church was where the Worship Centre would be. A decision was taken that the former Paisley High Church would be that place but it required a major repair and refurbishment. Following negotiations regarding funding and the level of work to be done, the contractor began work in September 1993, finishing 12 months later. With great joy and enthusiasm, Oakshaw Trinity Church met in its Worship Centre for the first time in October 1994. Oakshaw Trinity Church now had three other Church buildings. The former Congregational Church had been leased to the University of Paisley, the former Orr Square Church was to be sold; and the former St. John’s Church became the centre of a project to convert that building to a Christian Centre in the middle of Paisley which would expand on the work and witness already being done through the Wynd Centre. Throughout the creation of Oakshaw Trinity Church and its early years, the Church was led by the Reverands Ian S. Currie, Christopher L. Levison and John R. Smith whose guidance and advice greatly assisted the Church’s growth and development. The High Church was first envisaged in March 1749 and the purchase of the land was completed in December 1749. The Church was designed by Baillie John White and was completed in June 1754 at a cost of £1,588 12l 5d. The Church Tower was also designed by Baillie John White and was built between 1767 and 1770 by the Town Council and remains to this day in the ownership of Renfrewshire Council. The tower is 161ft high (49 metres). 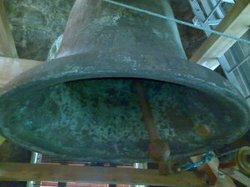 The first bell in the Church Tower was installed in 1771 but cracked in 1820. The second bell was paid for by the Manufacturers of Causeyside and weighed just under one ton. It was named “Roarin Tam” after a Mr Farquharson who was “most active in raising funds.” Contrary to tradition, it swings NORTH-SOUTH “so that the donors might hear it more distinctly.” In 1832, following a “stushie” the Church won an interdict against the Town Council to allow ringing the bell only for morning and evening worship and on occasions of public rejoicing. In 1865 the second bell cracked and the material re-used to make the third bell. In 1871 the third bell cracked and the fourth (and current) bell was installed in 1872. ​In 1994 came the most recent refurbishment and what you now see is the end result. In this work the Chancel was extended to enable a wider use of the building for functions such as choral and brass band concerts. The building is “A” listed and boasts the largest ecclesiastical ceiling of its type in Europe. It measures almost 90 feet east to west and the ceiling is totally unsupported. ▪ The original Halls were built in 1880 but demolished in 1920. ▪ These were located between the car park gates and the present halls. ▪ The Lang Hall was built in 1821/22 as Miss Hutcheson’s Charity School for orphans. ▪ As school requirements changed, this hall was used as an annexe to the Cholera Hospital during the epidemic in Paisley. ▪ Its use as an annexe during the epidemic resulted in people rioting in Oakshaw Street. ▪ The Church failed in a bid to purchase the hall in 1890. ▪ It became the property of the Lang Family but made available for Church use. ▪ The Main Hall and Session House was built in 1913. ▪ McLauchlan Hall was added in 1920. ▪ The halls were used as dinner halls for the John Neilston School around 1940’s. ▪ Lang Hall was gifted to the Church in 1935 but to be named LANG HALL as a memorial to the death of the benefactor’s sister, Margaret. ▪ Lang Hall has been “B” listed for many years but in 1998 the entire Oakshaw Suite became “B” listed. The circular entrance vestibule was designed by the well-known architect: THOMAS G. ABERCROMBY.